Celebrate the 30th anniversary of the Matsuri Cherry Blossom Festival in the Japanese Gardens in Cowra. With traditional Japanese displays, as well as markets and entertainment, admire this delicate flower as it blooms throughout the gardens. Continuing with all things spring, visit some leading cool climate gardens in Canberra and the Southern Highlands, as well as the Campbell Rhododendron Gardens, Quindalup Gardens, Everglades Historic House and Gardens, Red Cow Farm and more. 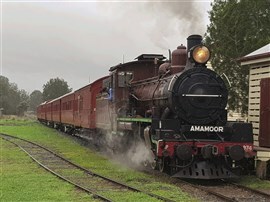 Brisbane passengers will fly into Newcastle, before a visit to the immaculate Hunter Valley Gardens for their springtime display. Take some time to explore the 14 hectares of gardens consisting of over 6,000 trees, 600,000 shrubs and over 1 million ground cover plants, plus waterfalls, statues, murals and more. After checking into our overnight accommodation, enjoy a buffet dinner at Billabong Restaurant. 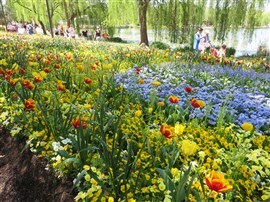 spring bulbs will be on display, including a sea of daffodils. This afternoon, we continue on to Lithgow for our overnight stay. Departing Lithgow this morning, we stop for a photo opportunity at one of the most famous lookouts in Australia—Govetts Leap. The magnificent waterfall drops 180m to the base of the cliff, and sweeping views down the valley to the Grose Wilderness will take your breath away. Continue on to The Campbell Rhododendron Gardens for a guided tour of the Rhododendrons, Azaleas, Mollis Azaleas and many deciduous trees. Continue on to Leura for a visit to Everglades Historic House and Gardens, featuring European gardens around an art deco heritage house. After lunch at Wentworth Falls, we continue on to Cowra where we check into our hotel. Today we will visit the Sakura Matsuri Cherry Blossom Festival which is celebrating its 30th Year in 2019. The Sakura Matsuri festival is held in the Cowra Japanese Gardens each year when the Cherry Blossom is at its peak. 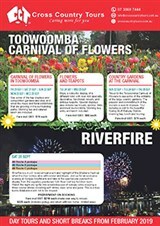 The festival celebrates the birth of spring and attracts performers from across Australia and around the world. Experience traditional elements of Japanese culture, including traditional ikebana displays, tea ceremonies and bonsai demonstrations. There will also be a variety of music, dance and martial arts displays. Purchase your own morning tea and lunch before departing for Canberra this afternoon, where we will unpack for three nights. above the summit of Black Mountain and offering spectacular 360 degree views of Canberra. Relax over dinner in our hotel. This morning take a tour of All Saints Church, once a Sydney mortuary railway station, painstakingly moved stone by stone to its Canberra location. Following more impressive views of Canberra from Mt Ainslee, we visit Cockington Green Miniature Village. After lunch visit the Royal Australian Mint and take in the history on display at the Australian War Memorial. 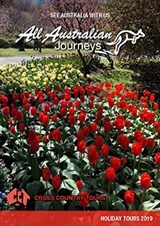 Departing Canberra, we return to our floral tours with a visit to Tulip Top Gardens, only open for a month each year for its vibrant displays of tulips, daffodils and spring trees amongst meandering paths and cascading waterfalls. After lunch in Goulburn, we visit the Red Cow Farm for a walk through its unique cool climate gardens. There are more gardens on offer, stopping at Leighton Gardens on our way to Bowral where we stay for the next two nights. This morning we visit Fitzroy Falls, a spectacular 81m waterfall and national park. The visitor centre provides information on Aboriginal heritage, wildlife and bird watching—while here you may even hear the Lyrebird singing. Visit Quindalup Gardens, a five acre woodland garden, before continuing on to the Bradman Museum and the International Cricket Hall of Fame for an interesting and interactive look at the history of the sport and its place in contemporary life. At Corbett Gardens, view the stunning tulip displays at the home of the annual Bowral Tulip Festival. 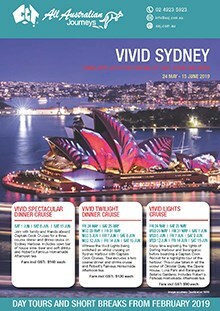 we head towards Sydney, enjoying lunch along the way. At Sydney Airport, our Brisbane passengers will fly home, while the coach continues through to the Hunter.